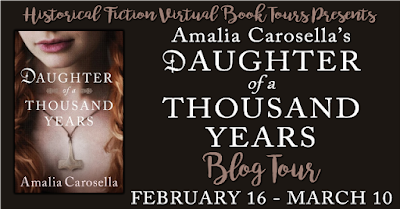 So I don't know if you heard but Amazon Publishing is giving away 100 Kindle Editions of Daughter of a Thousand Years over on Goodreads -- 100 copies!!! So I hope you'll all head on over and enter to win, because that feels like pretty good odds to me. Daughter is a book very close to my heart. 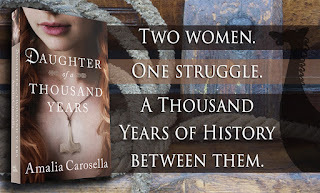 I've talked about this elsewhere, under my other author name and in my more personal interactions with people and fans, but I've been kind of a coward about it as Amalia Carosella. I've been afraid to be honest with you all about WHY it is such an important book for me. Which is kind of silly of me, and not only because I'm very forthright about it in my author's note at the end of the book. But you see, it's in part my own fear that makes it so important to me. As authors, we're kind of expected to simultaneously pour our lifeblood onto the pages of our books, and at the same time, remain apart from them, to cleanse and cut any obvious ties between ourselves and the story we're telling. Our books are both about ourselves, our issues, our struggles, our moral and ethical dilemmas and... Not. Most of the time, it isn't until I've finished writing a book that I look back at it and go "oh. I guess I was trying to figure x out still." Daughter was different, though. Daughter was the book that I knew was going to make me bleed from the start. The book I wasn't ready to write. The book I knew was going to make me deal with all my fears regarding my own faith, my own failings, my own existence in this crazy world we live in. I am not Emma. Let me put that out there first and foremost before I go any further. I am not Emma, but I have felt the things Emma has felt. Emma's fears have, to a vastly different extent in some ways and to a similar degree in others, been my fears -- and this blogpost is proof that I haven't conquered all those fears yet. That I am still struggling with some of the things that Emma struggles with. Because although I am not Emma, I am, like Emma's character, a pagan polytheist. A Heathen, specifically. My spiritual experiences have been prevailingly Germanic-Norse, not Abrahamic. And let me tell you, squaring all that up with a Catholic upbringing was... pretty terrifying for me. Even more so when I realized I was suddenly on my own, alone, without the comfort and support of the Church to provide a community for me anywhere I went in the (Western) world, without the reassurance that there were literally millions of other people out there who shared in what I believed. There is so much strength in numbers. In community. There is so much power there to lift us up, or strike us down. And when we can't see ourselves in the community we've been immersed in, when it feels like we don't belong there anymore -- it is so, so hard. But that's what makes this book matter -- to me, maybe to someone you know, but didn't realize needed it, or maybe to you -- because I don't want it to be as hard for someone else. I want them to see themselves inside the community, somewhere, somehow -- even if it's just the community of people who love books. 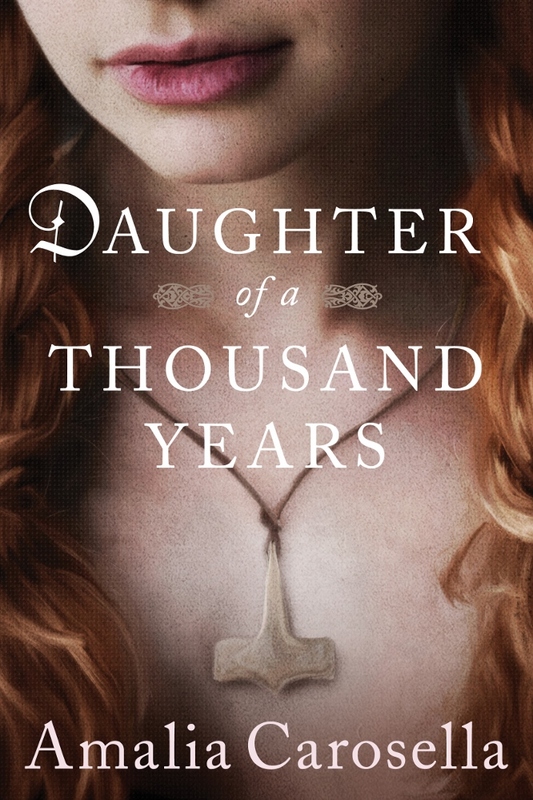 DAUGHTER OF A THOUSAND YEARS is in large part (half) a book about Erik the Red's daughter, Freydis. 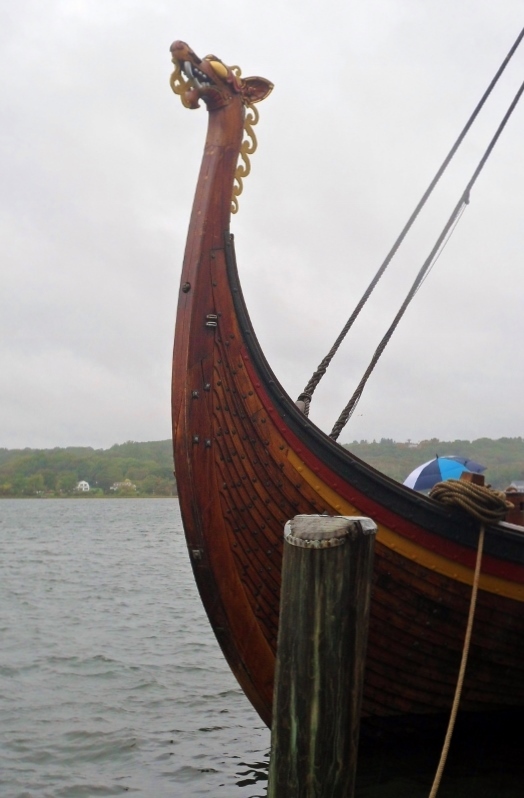 She also happens to be the (half) sister of Leif Eriksson aka Leif the Lucky -- who you probably are familiar with via Leif Eriksson's Day, that holiday around Columbus Day that celebrates Leif as the actual first European to stumble across America. (Which is maybe not even true either but for the moment, we'll let that lie.) So why write about Freydis when I could write a book about Leif or Erik? There are a couple of reasons. A multitude, even, but the first and foremost is that Freydis Fights. She is such a rich and defiant character, even in the sagas, where most characters are not really painted beyond their broadest strokes. But Freydis had personality. She went against the grain, did things that seemed ridiculous and mind-boggling and even awful. And I wanted to know why. I wanted to know what provoked her, what compelled her to act in the ways that she acted, contrary to the ways in which she was expected to act or behave. You see, in the Vinland Sagas, there are plenty of clearly pious characters -- good people who are wise and act appropriately. Leif is one of them. Not exactly a hero, because he's not really the focus of the story, but certainly a Good Man (tm). Gudrid and Karlsefni, too, are very pious, very Good People (tm). And Freydis -- well, there's some debate as to whether Freydis even lived, or whether she was wholly invented to act as a foil to Gudrid and the other Good People, the pious, Godly people. Which made her that much more perfect for fiction, naturally! Built in conflict and turmoil, and a chance to understand what might have made her UNgodly and UNpious. What made her trouble, when everyone around her was trying to become Great and doing work in God's name? 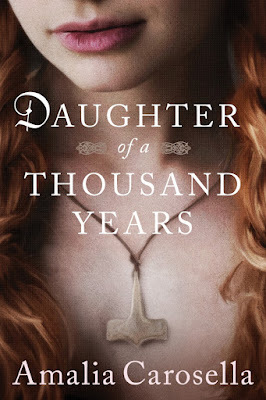 You'll have to read DAUGHTER OF A THOUSAND YEARS to decide for yourself whether you agree. Don't forget you can request a review copy still, via Netgalley, and we'll be blogtouring beginning February 16th! In the meantime, maybe you want to mark DAUGHTER to-read on Goodreads? Or dare I dream that you'd even go so far as to pre-order? So for many years, thanks to the genius of Frankie Diane Mallis, there was this post-New Year's Day tradition of a No-Kiss blogfest (That other me even hosted it once). The idea was that writers across the blogosphere would post an excerpt from their work in progress of one of those key moments of unresolved sexual tension. Where a kiss might have happened, but didn't. Or just leading UP to a kiss, but without the kiss itself. It was a lot of fun, but as with many things, fell by the wayside as people moved away from blogging as their primary networking push. But I'm feeling nostalgic today, and since we're just a little short of two months away from the release of DAUGHTER OF A THOUSAND YEARS, I thought you might appreciate a little teaser action. So to speak. For context: This scene takes place in Viking Age Greenland, around the year 1000 -- give or take. Freydis is the daughter of Erik the Red, and like her father, she is a defiant pagan in a world that is quickly becoming more Christian than anything else. Enter a very bold man named Sonnung. I sank up to my neck in the steaming water of the spring, sighing with pleasure at the warmth before pinching my nose and submerging completely. The water was almost too warm, the heat burning against my eyelids, and I did not like to think of the mess I was making of my hair, dousing it this way, but I used my free hand to loosen it from the thick braid I’d worn to keep it from tangling during the long weeks I had spent in my bed. The cleanliness of my body would be worth little if my hair and scalp still stunk. My lungs ached, wanting to breathe, but I waited until I was truly desperate before I broke the surface again for air, gasping, then coughing from the sudden cold. “Then it’s Gudrid you want, not me.” I rose, not caring what he saw, meaning to haul myself back out of the water. My arms were weak, trembling, and I fell back with a splash, which only made me all the redder, shame flushing my cheeks. I grasped the turf and tried again. “Freydís.” My name on his lips was a prayer. Admiration and desire, awe and naked need. three-legged, as Thorvard was, but large enough all the same. And hard. The steaming water was cool against the heat of my skin, of his. “And if I refuse?” I asked, my voice far steadier than I felt. “I’m not used to being refused,” he said, but there was humor there again, lurking beneath his words. Amusement at the game I played, even at his own expense. He growled, but a moment later, I was standing upon the turf, shivering in the cold. He followed easily, vaulting from the water, and tossed me my cloak before I’d even had time to think of reaching for it. “Dress before I change my mind,” he said. I hope you enjoyed the excerpt! 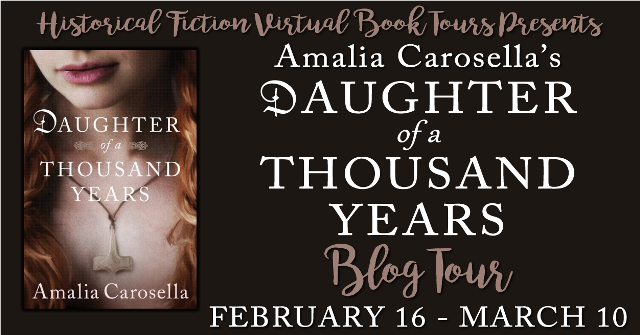 DAUGHTER OF A THOUSAND YEARS will be blogtouring beginning February 16th with HFVBT, and releases on February 21st! So don't forget to mark it to-read on Goodreads and if you liked the above, maybe even give it a pre-order!